The leaders of South and North Korea will sign and announce a joint agreement, after their historic summit talks on Friday at the border village of Panmunjom, a Seoul presidential official said. A day ahead of the summit, South Korea's chief presidential secretary Im Jong-seok briefed reporters at the summit press center on the details of the rare inter-Korean talks, the first to take place in eleven years. South Korean President Moon Jae-in and North Korean leader Kim Jong Un are expected to focus on the issue of denuclearization of the Korean Peninsula as well as establishing peace between the two Koreas, Im said. The two leaders will hold two rounds of summit talks in the morning and in the afternoon, at the Peace House conference building on the South Korean side, before signing and declaring their joint agreement. "We hope to call this the Panmunjom Declaration," Im said. "If the clear intent for denuclearization is stipulated, if [the two leaders] can confirm the [intent for] complete denuclearization of the Korean Peninsula, this summit would be a success and pave the way for the U.S.-North Korea summit." However, he added it was yet difficult to determine to what extent the two leaders will agree on, in regard to denuclearization. "It is especially tricky as the issue isn't something the South-North summit can wrap up," Im said. 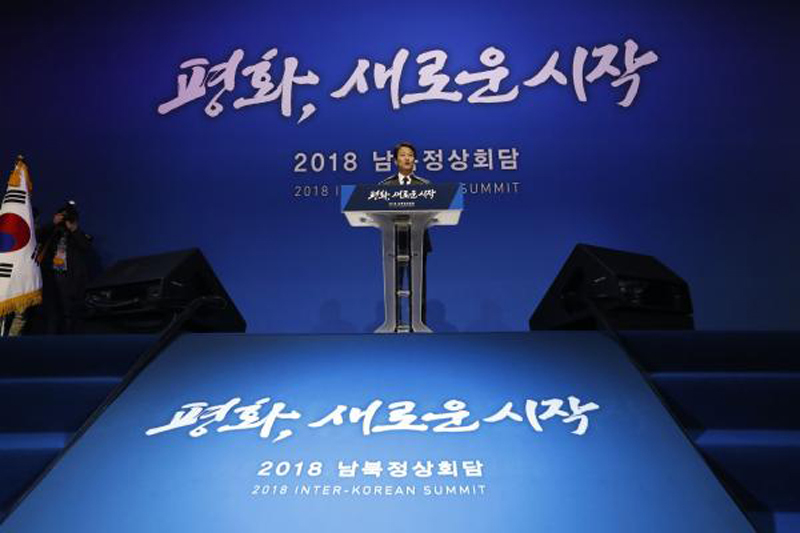 Seoul officials have said the inter-Korean summit is likely to provide the initial framework for the further discussion on denuclearizing the North, ahead of U.S. President Donald Trump's meeting with Kim in the coming weeks. "Chairman Kim will walk across the MDL between buildings T2 and T3 that are used as the meeting rooms of the Military Armistice Commission," Moon's chief secretary Im Jong-seok told reporters at the press center for the summit. This marks the first time a North Korean leader cross the border since the 1950-53 Korean War and, also, the first time an inter-Korean summit takes place on South Korea's side. The past two summits in 2000 and 2007 were both held in Pyongyang. South Korea's guard of honor will greet the leaders as they walk to the ceremony area at around 9:40 a.m., before they enter the Peace House. Moon and Kim are expected to hold a photo session and a reception meeting before holding official summit talks from 10:30 a.m.
After the morning schedule, they will hold separate lunches and a brief break, during which Kim will cross the border back to the northern side. The two leaders will resume summit talks, in the afternoon, after a tree-planting ceremony and a stroll by the MDL. "The two leaders will together plant a pine tree, which stands for peace and prosperity, on the MDL, which has symbolized confrontation and division over the past 65 years," Im said. Soil from the South Korea's Mt. Halla and North Korea's Mt. Paektu will be used to plant the tree, after which Kim will water the tree with water from the South's Han River and Moon will pour water from the North's Daedong River. From 6:30 p.m., Moon and Kim will take part in a welcoming banquet in the Peace House building, which will also be attended by all officials from both sides. Moon will be accompanied by Im Jong-seok, national security adviser Chung Eui-yong, intelligence chief Suh Hoon, unification Cho Myoung-gyon, defense minister Song Young-moo, and foreign minister Kang Kyung-wha. Nine top-ranking North Korean officials will accompany Kim Jong Un, including his sister Kim Yo-jong; the North's ceremonial head of state Kim Yong-nam; ruling Workers' Party vice chairmen Kim Yong-chol, Ri Su-yong, and Choe Hwi, army chief Ri Myong-su; defense chief Pak Yong-sik; foreign minister Ri Yong-ho; and unification head Ri Son-gwon. As opposed to the past (inter-Korean summits), the North's delegation includes military and diplomatic officials," Im said, adding this came as a surprise to Seoul. Im confirmed that there are no plans to extend the summit schedule as of now.